Based in Central New Jersey (Hunterdon County) since 1990, we cater to both residential and commercial customers. Our company's customers span from the individual homeowner to hospitals, apartment buildings and schools. Being family owned and operated I take the time to do a quality job. I will not be happy until you are satisfied. When you call you will be speaking to me on the phone, the same person who does the job! I take pride in my business and my work. I will return your call and show up for work on time! I work with your contractor, plumber and you to help create a new looking and lasting bathtub, bathroom or pool step. I am a trained repair specialist through the Acrylic Masters National Repair Network. 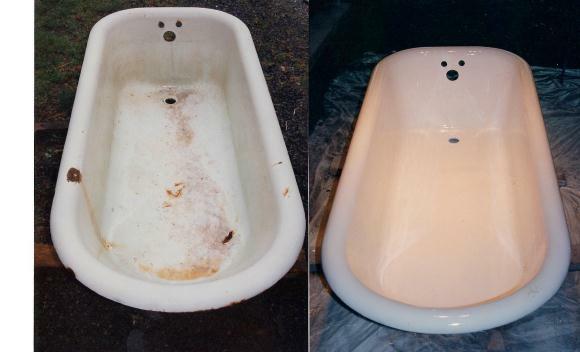 I use state of the art equipment to repair or reglaze your tub, tiles, sinks, fiberglass and more.